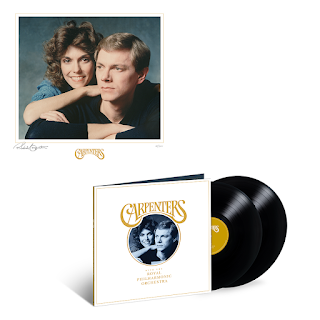 I have a slightly ambiguous relationship with these albums, which seem to be everywhere these days - Elvis, Buddy Holly, Roy Orbison, The Beach Boys....now The Carpenters. Half of me prefers to listen to the originals, which I consider to be the default recordings of the songs, but there is a part of me that enjoys these sonic experiments and finds them a most enjoyable listen. The Carpenters' music would seem to be tailor-made for this type of makeover, as they were always brilliantly orchestrated anyway, like Buddy Holly's romantic (non rock 'n' roll) numbers. Therefore, songs like "Yesterday Once More" are not going to sound too dissimilar to the original, other than I have to say that the sound on this album is absolutely superb. Nice and warm and bassy, which is to my taste. There is a real fullness to the sound. It is quite good that this is not simply a "greatest hits" album as well, and tracks like "Hurting Each Other", "I Just Fall In Love Again" (with it's "Goodbye To Love" guitar part), The Beatles' "Baby It's You" and "I Believe You", among others, make an appearance. It is also a nice touch that before the vocals arrive on some of the tracks, you get an orchestral part with snatches of other tracks. For example, a bit of "Rainy Days And Mondays" floats around before Karen starts singing "I Need To Be In Love". That didn't happen on the Buddy Holly album, for example. You get brief instrumental introductions to each song that gives the album a real continuity. (The Christmas track half way through only works in December, of course, you won't want it coming on in July!). I have to admit to a weakness for the jazzy, laid-back tones of "This Masquerade". It is done beautifully on here. Now - yes, yes, yes! They have left the iconic fuzz guitar solo at the end of "Goodbye To Love"! Plus some Beatles-esque French Horn (?) just before it enhances my favourite Carpenters track. 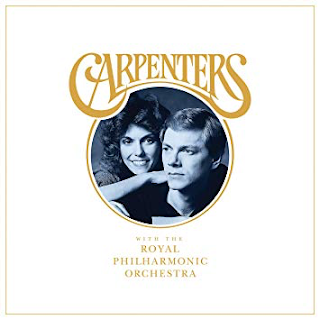 The album highlights just what a great voice Karen Carpenter had (as if anyone needed convincing) and I have to say that and what an instinct for a melody Richard Carpenter had. He conducts the orchestra throughout, apparently. Whatever one's musical taste or background, it is difficult not to accept that this music is sheer quality.